Happy Birthday Pencil Skirts and Noodle Necklaces! One year and 142 posts later, my baby is turning one today. Honestly, I can't even believe that I have had this little home in cyber space for a whole year. Guess it is true what they say, time flies when you are having fun. In the last year I have ranted, raved, shared, and poured my thoughts on to the keys of this computer cuddled on the couch in the evenings after my two tinies have retired for the night. I love that I can look back and see our year in focus on the little things that make our lives our own. Thank you for coming along on this journey with me. I had no idea how to celebrate a blog birthday...or blogiversary...whatever you want to call it. In fact, I honestly thought it was tomorrow, until I started looking back at old posts tonight. I was going to eat a cupcake to celebrate, but since I don't have one here tonight...it will have to wait until tomorrow. Better late than never when it comes to cupcakes. I went to IKEA today, so now that I know it is my blog's birthday today, I'll say that was a blog birthday adventure! Sound good? In the meantime, I'll look back at a few of my favorite posts from the past year. Of course I have to start at the beginning. I'm not sure if I would call it a favorite post of mine...but it was the beginning. Therefore, the birth of this blog. I remember typing it and posting it out to my site, knowing no one would ever read it...at least until I was comfortable enough to tell people it was out there. And...then...it was as if I was pushed onto a virtual stage as my husband slyly posted it to his Facebook account. "For some time now,I have been telling my wife, Nicole, that she should blog about her daily life. Somehow, she manages to balance being a stay at home mom, a corporate management position, and still has dinner on the table when I get home from work. I know this to be true for many of you, so I invite you read along with her adventures and share your own with her! Happy New Year :)"
I was mortified. And...then...shocked that people were reading what I wrote. It was such a surreal feeling. People were actually taking the time to read my words. And that was that. The beginning of Pencil Skirts and Noodle Necklaces. I have made a habit out of posting about work...like these. And of course...My Tuesday's Love and I'm Better Off Without Lists. ...and so many more in between. Not sure which post was my favorite of the year, but I love that the collection of all 142 tell the story of many of our highlights in the last year. I am excited to see what 2013 will bring! Thanks you for sharing the last year with me. I have made new friends and I hope that you find yourself at home here in this little corner of the Internet. We are still in vacation mode in our house. Too much sugar. Questionable napping schedules. No planner usage in over a week (which might be why I double booked our social calendar for tonight. Oops.) Two toy piles still remain. I saw a quote this week that said something about the mess made on Christmas morning is the most fun mess we ever make, so don't be quick to pick it up. Well, it's killing me...but I'm trying to go with the flow. We are putting things away slowly...and playing with them even more. I love this week - the week between Christmas and New Year's - every year. Fun with family and friends...who could ask for more? Wanna take a peek into our last week or so? 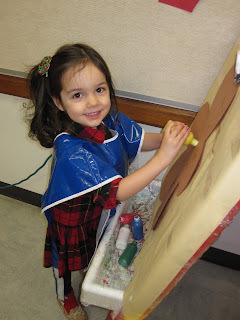 Jillian at her school Christmas party. She was so proud. Circle time is more fun when your mom is there...or so I have heard. That afternoon it was on to Myles' party. I worked the cookie decorating table with a friend. Best choice ever. It was the favorite "center" of the day. Who wouldn't like the cookie decorating, eating, and hot cocoa center the best? The Eve of Christmas Eve, my beautiful niece was baptized. 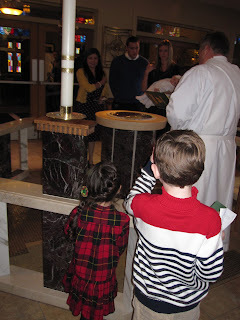 I love this picture of Myles and Jillian witnessing the Sacrament. How do you celebrate your baptism? By a swimming party afterwards, of course! I love the look on her face. On to Christmas Eve. These cousins just loved posing like this...can you tell?? Ha. I hosted 19 on Christmas Eve and 8 Christmas morning. So happy to celebrate with family. Here is a peek at the table...or at least a setting or two. I love that I can use my Grandma's gold silverware for half of the place settings. Silver and gold on the same table screams Christmas to me. Poppers are an English tradition that we keep each year. Love it. My awesome baby sis made a Pinterest pin of mine come to life for me for Christmas. At least someone makes virtual decorating a reality out there. 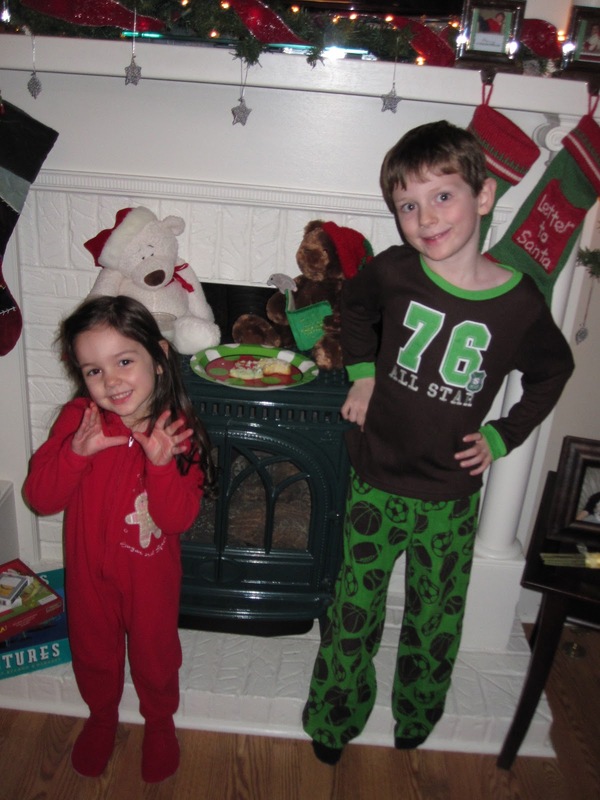 Myles and Jillian leaving their milk and cookies for Santa by the fireplace. AND - on to the most important job of the evening...putting baby Jesus into the manger. Christmas morning brought squeals of joy and excitement. 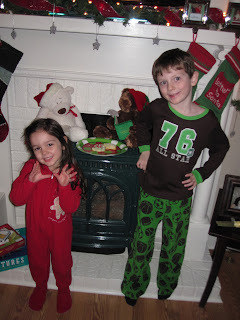 Santa's letter included a comment about Blitzen loving the sprinkles (on the cookies). 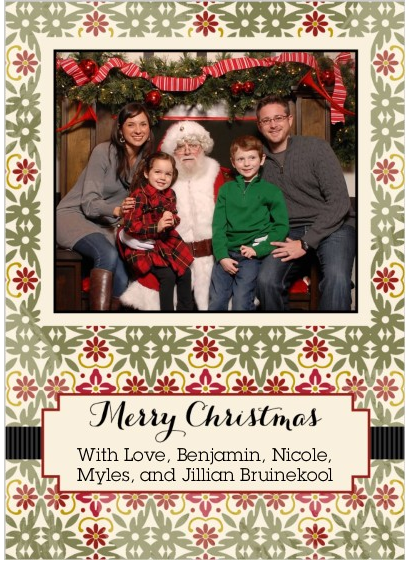 Jillian has told the story to every person we have seen since Christmas morning. She thinks that is just the funniest thing ever. Myles waited until 7 am to wake his little sister. "Sis!! Let's go see if Santa came!!!!" Her response was priceless. "Ohhhh!!! Myles!!!! You get to open what I got for you!!! I can't wait!!" Love it. It was giving excitement, not just receiving. Just fills my heart. 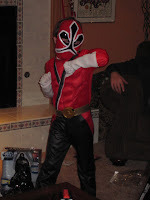 This photo is him opening it...A blue Power Ranger. This present... Ugghh. One of my bigger mistakes of the year. She didn't know it yet, but her face describes how I feel about what is in that wrapping. This face too. The doll. It poops. I hate it. She loves it. This year at Ben's grandparents house, his amazing Aunt Julie started a new tradition (or at least I hope it becomes a tradition). Minute to Win It Christmas games. The kids loved it. The teens loved it. The parents loved it. The grandparents loved it. Amazing. Here, Jillian is stacking nuts with a candy cane (cheating oh so slightly with her little hand). Tossing marshmallows into a wreath bucket. 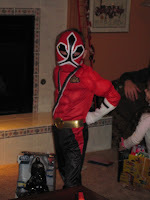 Notice the adorable pink dance outfit? A gift from an awesome older dancing cousin to a first-year ballerina. So cool. She wanted to put it on. Even better. Trying to stick Rudolph's nose onto her nose without hands. There were so many fun games - I didn't even capture them all here. After ten years of marriage, I guess Ben and I have learned something about communication...winning this game by more than doubling the next closest pair. Twenty ornaments balanced in one minute without it tipping over. Can you tell I am proud? I have to have some sort of claim to fame, since I jerked my neck for a minute like a fool and never mounted the red nose on my own. Christmas is a time for family and friends. We are maximizing that this week. Hope you are enjoying yours. I have some changes in the coming weeks at work. I'll get around to posting about it soon, but for now I'm going to continue my no-calendar, fun-focused schedule. 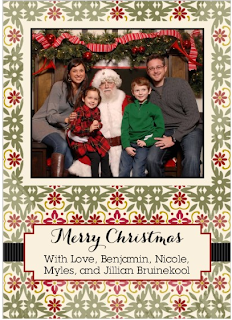 All my best wishes for smiles, hugs, and full tummies this Christmas Eve. Decorating cookies with my mother-in-law tonight. An email message from a friend telling me how sweet my little boy truly is. He sat alone on the bus on Friday because he felt that he was getting sick and he didn't want his little friend and her family to catch it. It proves once again how caring of others he truly is...and how my germaphobe tendencies have taught him a thing or two about germs. Peppering my kids with kisses until they squirm and and squeal. On days that I work, I wake Jillian for a little bit of time together. It is all that it takes to start her day off right...and with no tears. Christmas gift giving. 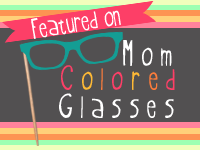 I love looking for the perfect gifts that my loved ones will love...especially from Etsy...and especially personalized. Christmas break. I can't wait to be home with my little munchkins for that many days in a row. My sister watched my kiddos this weekend so we could finish our Christmas shopping. Opening the mailbox to greetings and well wishes from family and friends. School Christmas parties. Thursday is going to rock. I'll be going from one for Jillian to one for Myles. I'm prepared for excited smiles, giggles, and happy faces! My kids are so excited to give their little trinkets to their friends. Wrapping presents on the floor of the family room with Ben, surrounded by wrapping paper, gifts, and a good Christmas movie on the TV. Jillian: "I can't wait for Santa to bring me my Dreamlite. I cant wait to see how it works!" Myles: "Jillian. Christmas is not about receiving. It is about giving and it is about Jesus." Jillian: "I know, but I still really want a Dreamlite." Eh. I'm not really in the mood for this list tonight, okay? I'm too busy loving my loves tonight. This weekend I had no words. There was no way I could write...I had no words to express my sorrow for the families that are forever changed after last Friday. No words to express how I felt for the millions of Americans that are grieving after yet another tragedy with seemingly increasing severity. I have shed so many tears. Tears for the victims and the tragic events, but also tears for the heroes and the stories of the good people in our world. I don't know how people affected can get past such a tragic event, but I do know what I plan to do. Focus on the good. Focus on the heroes. Focus on the innocent babies that are at peace in Heaven. And pray. 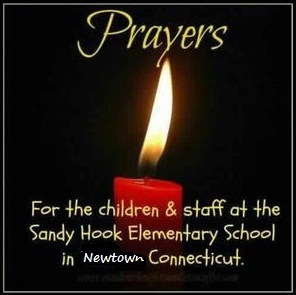 Pray for the victims and their families. Pray for your children. Pray for my children. Pray for our country to find peace in a world of increasing violence. I'm grateful. I'm grateful for the children asleep tonight, tucked into their beds. I'm grateful for Myles' teacher that I was able to share notes with on our feelings. Grateful for the good...and something to look towards. Give your babies extra hugs and kisses. Tell them you love them...too many times. Cherish them. Sending hugs to all of you, my friends. 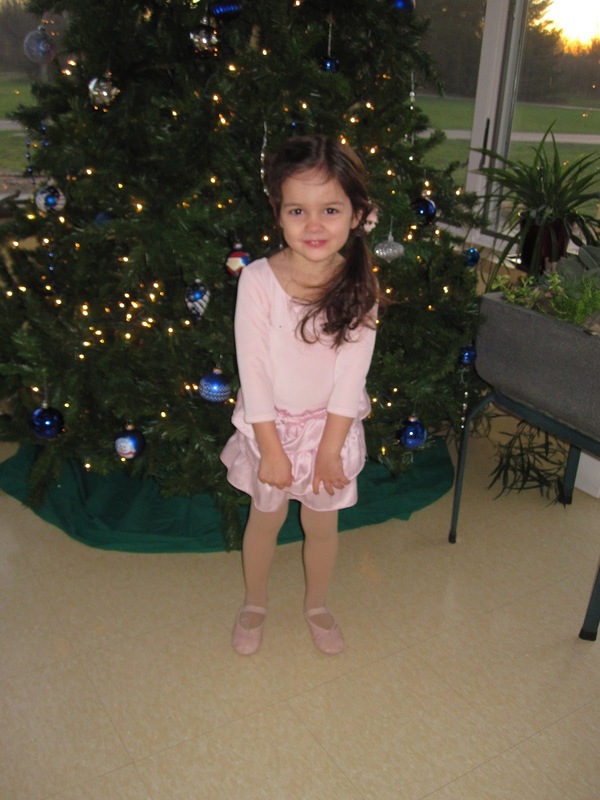 Jillian and the Christmas tree at dance. Today I had a "coffee date" with Jillian Kate. Let me clarify...I hate coffee and she is three. Yet, she insisted on calling our trip to Panera for lunch a "coffee date". Fine with me. She had mac and cheese (her fave) and I had a salad. I did have iced tea...close enough to coffee, right? Well, it turned out quite like a coffee date, despite the lack of any hot beverages. She talked. And talked. And talked. And I listened...and took great enjoyment in every word. You know...sometimes I am with my kids and I am listening to them...but am I really listening to them? Not entirely. Not the intent listening when you are engrossed in conversation with a good friend over coffee (or tea) kind of listening. That is exactly what I did at lunch today (I mean our coffee date). I hung on every word. Jillian is not shy, she never has been. She talked and talked to me about everything that was on her mind. She engaged the woman next to us in conversation about her hot pink glasses. Jillian thought they were quite fashionable and she was sure to tell the woman that she liked them. "It's my favorite color, you know...PINK!" Come to find out, the woman has a dog named Pink and she proceeded to show Jillian a picture of her. "Mom, her dog's name is Pink, but she is NOT pink. Only her collar is pink, Mom." She led our entire conversation from describing how to sit like a lady to singing her favorite rendition of Rudolph the Red Nosed Reindeer, all while she crammed her little mouth with huge spoonfuls of mac and cheese. You know when you leave a coffee date with a good friend and get in the car smiling, relishing in the fact that you can call the amazing woman (or man) that you just left, your friend? Well, I feel the same way about my tiny little Jillian. She is so special. I look forward to many years of coffee dates in our future. Here is a picture of her waiting for her dance class tonight (I am writing, as I wait for her). She was peeking in on a friend. Have an awesome Thursday, friends!! Myles is happy and easy-going, no matter what the situation. He always has a smile and a hug ready and waiting. He tries his very hardest at everything that he does. Today, Ben and I met at Myles' school to sit with him while he ate lunch (that we brought in for him). He was ecstatic. (See pictures above.) He told me that it was one of the best presents he received for his birthday (aside from his new 3DS of course :). Myles has a knack for spacial awareness. We can be in the basement and he can tell me what is above us on the first floor, and the second. He must get that from his Daddy - along with his dashing good looks. Despite his long, skinny, and bony legs, Myles is a great cuddler. Myles is such a caring little guy. He cares about everyone else around him. We often hear, "How was your day today, Daddy?" "How are you doing today, Mommy?" 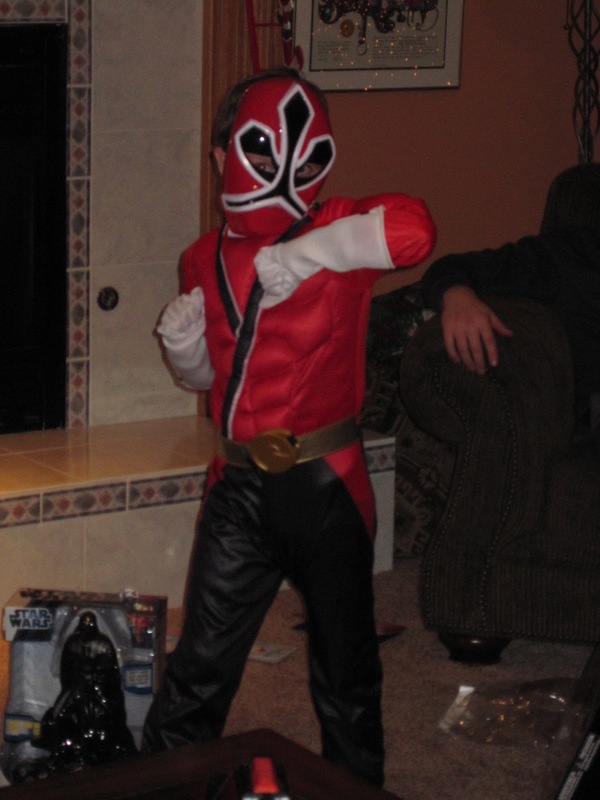 Tonight, Myles received bunches of Power Rangers stuff - something he asked for from his Nana, (and something I hardly even knew he cared about! School playground influence for sure!) 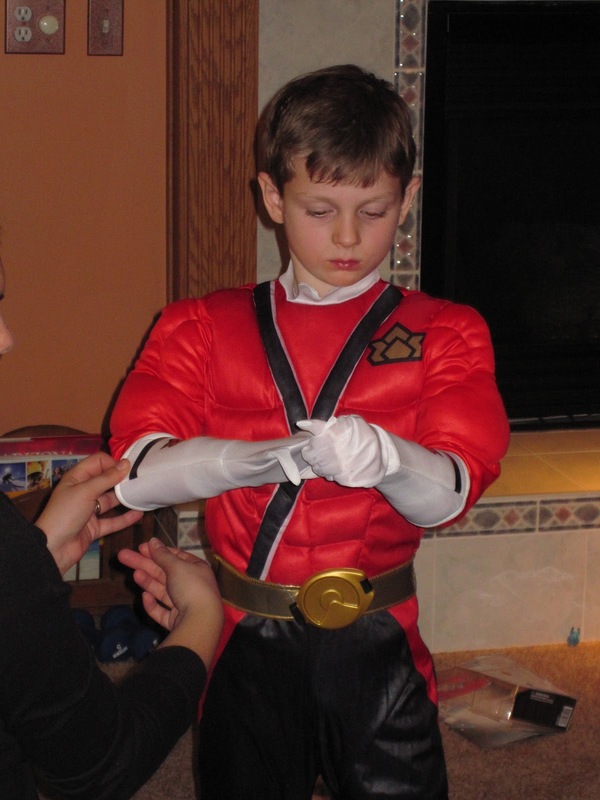 He was in costume tonight...posing...or flexing I should say. Love it. Honestly, I could go all day listing things that I love about the little guy sleeping upstairs after an exciting birthday. I love every little thing about him and I cherish the extraordinary gift that I received six years ago. I love you, Myles Jacob!! Wassailing and Birthday Parties, Oh My!! Myles admiring the reindeer. They didn't fly on Thursday...just an FYI. Jillian, being Jillian. You can't see it...but I have mastered french braiding. This night it started on the left side of her head and went all the way around to the right and ended in a side pony. I'm quite proud. Cookies and mittens...they go together perfectly. Myles and Jillian. Best friends. You can see it, can't you? This weekend was a birthday extravaganza for Myles. His special day isn't until Tuesday...so we are sure to continue the festivities for the next two days. 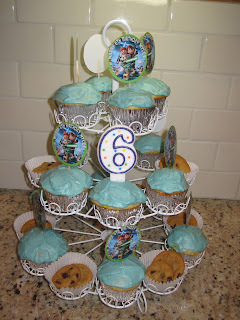 You only turn six once, right? Saturday night we let him choose where we went to dinner. Red Robin was his choice, but a long wait had him calling it, "Not a very good choice, huh?!?" We ended up down the street. In the process, he saw Hooters for the first time. Immediately he wanted to go to the "owl restaurant". Awesome. Starting them young, I guess. He didn't get his way. I can't remember what Jillian was telling me here, but it was quite comical if you ask her. Then...today...we had bunches of tiny friends over to par-tay. It was a blast. Jillian dressed as Princess Leia by her own definition. Waiting for the guests...they were so excited. 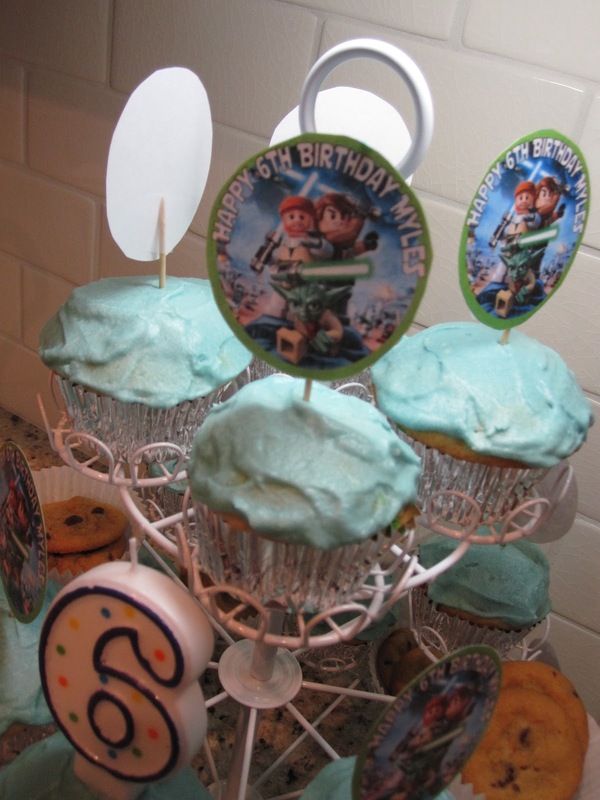 This party was far from Pinterest-worthy...but it proved my husband's theory - the kids don't care. They care about sweets, treats, goodie bags, and fun. I did pre-scoop my ice cream, more for me than anyone else. I didn't have to do it at the last minute - super helpful. Cupcakes and cookies, rather than an elaborate cake. They loved them. I do have to say though - my frosting is quite tasty. Know what the secret ingredient is? REAL vanilla, not extract...the real deal...straight from Haiti, thanks to a dear friend. 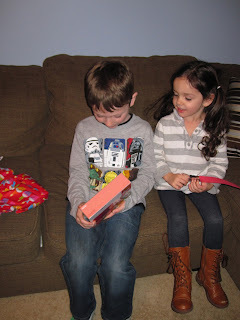 We decorated light sabers, played pin the light saber on Luke Skywalker, snacked on kiddie food, and opened presents. The rest of the time was play time. It appeared that everyone had fun. It was super simple and I can admit that Ben was right. (Ouch that hurt.) Pinterest-worthy parties no more for this girl. After all of our friends were gone, Myles opened a present from us. A very exciting night for our little guy. All three of them, actually. AND - Jillian received a hand-me-down toy that she was quite excited about. Myles was such a sweet brother to give it to her. It was a weekend for the history books over here. Hope yours was a blast too! !